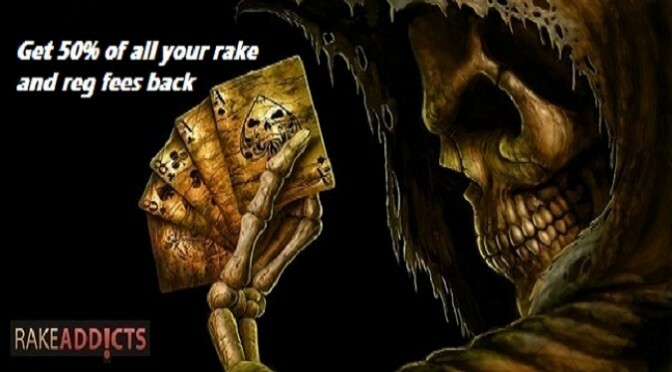 Rake & Rakeback explained for Online Poker. Any regular online poker player will tell you its not just other players you have to beat to make money at online poker, there is a silent enemy out there known as “The Rake”. Rake is all the standard fees paid by every player in online tournaments and cash games. Tournaments fees: a 10% reg fee on top of the entry ie £20 + £2. Cash table fees: 5% rake from each pot up to a max of £3 so if you win a £40 pot you will pay £2 rake or a pot of £100 you will pay the maximum £3 rake. Rakeback is the % of your rake and reg fee you get back and can be the difference between most winning and losing players online in the long run which leads us on to the purpose of this website. Rakeadd!cts has negotiated some of the best Rakeback deals for players which include sign up bonuses up to $2,000. These fees seems insignificant until you realise how much you are paying in total and how much better off you’d be if you got up to 50% of it back. Click on any of our banners/links in the information pages listed for each site and when you sign up your account will be tagged to the Rakeaddicts affiliate code and best deal applied to your account. Pokerplex24 is currently our best site/deal for rakeback with an upgrade to VIP 7 for 50% rakeback & £1250 sign up bonus. We have lots of new info on Pokerplex24 including their upcoming £100,000 of freerolls in August 2014.